As previously stated, the airborne photography program conducted for many years by the Air Board and then the RCAF, provided a picture of the ground features but the position of those features were not established accurately on the earth’s grid nor in relation to other geographical points. The traditional method of Geodetic survey; that of triangulation, i.e. precisely measuring all the angles of a triangle and calculating the position of the vertex when the positions of the other two points are known, though accurate, was extremely difficult in Northern Canada, and totally impractical in Arctic Canada. Even had this method been feasible, it would have required about 200 years to complete the task! An alternative method, of determining geographical position using celestial observation, did serve as a temporary expedient. 413 Squadron of the RCAF supported this task for a number of years, but the method was in itself inadequate, both in accuracy and in time required for survey completion. In essence, the national requirement was for a survey of much of the nearly 4 million square miles of Canada; a new technique had to be developed to accomplish it. J.E.R. Ross, for many years Dominion Geodesist, asked the RCAF shortly after World War II, if it would be possible to check the accuracy of aerial photography for mapping purposes by employing radar. Following investigation, the RCAF suggested the use of SHORAN (for SHOrt Range Aid to Navigation), a system developed during the war to guide allied aircraft to precise bomb release points. The system employed the principle of time difference measurement from an aircraft to radar transceivers from two portable ground stations. The airborne radar transmitted pulses that, when received, were re-transmitted by each of the ground sites. By measuring the time difference between the two suitably-coded return pulses on airborne equipment – a task requiring skilled airborne operators – the precise position of the aircraft relative to the ground stations could be determined and, most importantly, the exact distance between the two ground stations could be established. Thus, by sequentially relocating the ground stations, and using trilateration, that is, by measuring the three sides of a geodetic triangle rather than its angles, then setting up an interlocking series of these triangles, the whole of Canada’s land mass could be surveyed in a reasonable period of years. The SHORAN survey method was tested and evaluated by the National Research Council (NRC); the Department of Mines and Technical Surveys; the Dominion Meteorological Service; and the personnel of 413 Squadron using Lancaster and Mitchell aircraft. A famous wartime unit, 408 (Goose) Squadron, was reformed at Rockcliffe on January 10th 1949, equipped with eight Lancaster Mk. X modified aircraft, four of which were fitted out for SHORAN operations. So equipped, 408 was assigned the task of carrying out the SHORAN survey of Canada. This task was in every way a formidable challenge. The operation started from a point – actually a measured distance between two points, ‘Sprague and Camp Hughes’, just South of Winnipeg which in turn were tied into the United States’ own survey at ‘Meade’s Ranch’ in Kansas. Over the years many different means were used to transport stations to their locations, from flying boat and float and ski-equipped aircraft to bulldozers, dog teams and, on rare occasions by helicopter. The latter were of very limited value because of their operating range and need for extensive support requirements. The lower Arctic Islands operation required both the use of ski-equipped aircraft and amphibians as open water conditions could not be counted on for the whole period the station would be in operation. The use of Canso and Otter aircraft for installations on the ocean was also fraught with dangers from ice flows trapping aircraft on shore or sea conditions becoming dangerous for take-off following a lengthy installation. Pilots of the float equipped aircraft were taught astro as it was often needed to set steering gyros and fix position in the areas where magnetic compasses were unreliable, particularly was this so in 1953. ‘Line Flying’, the term describing the complex procedure for measuring each line, required a team effort of both the ground and the Lancaster air crews to ensure the data was precise at all times. Lines varied in length between 100 to 400 miles, averaging about 230 miles. The Lancaster aircraft had to be operated at an altitude sufficient to receive signals from both stations, often at 20,000 feet or even higher. Line flying required careful planning of daily flights taking into account line length, fuel load, the distance from base and time to alternates. Suitable alternate airfields were few and far between, weather forecasting doubtful because of the very scattered reporting stations and the often very difficult communication conditions. Dangerous incidents did occur over the years but the SHORAN Operations Officer was always conscious of safety in the difficult flying conditions the high latitudes presented and planned accordingly. Each ‘line’ between two stations had to be measured by a procedure that involved flying eight transits at the midpoint of the line, crossing it at an angle dependent upon the wind velocity. As the aircraft approached the line, the measured distance would decrease to a minimum and increase again after the line was crossed. Permanent photo records of the distance counters on the airborne set were made at three-second intervals. The navigator used the information from the stations to direct the aircraft precisely while the airborne radar operator tracked the returning pulses from the stations. Precise coordination between navigator and radar operator was essential. The navigator also directed the coordination with the ground stations arranging antennae orientation and operating times through the radio officer operating on HF voice or Morse code. the second would be airborne at noon hour. Flights varied in length from 8 hours to 11 hours. Several days after completing the first set of transits the line had to be flown a second time. If the two line measurements differed by more than 50 feet, the line had to be flown again. The station position was not calculated until all lines to that station were complete. Re-flying lines was not a welcome task but it was essential to maintaining the required accuracy. When ‘line flying’ on any given station was complete, that station’s equipment would be leapfrogged to another point in the chain and operations thus progressed across the whole chain. To ensure continued accuracy, the SHORAN equipment had to be calibrated before and after each season using a baseline in Winnipeg. One exception to this occurred in 1953 when C-119 aircraft returning equipment to Rockcliffe experienced engine trouble and jettisoned several sets over the Ungava region. SHORAN survey operations began in 1949 at Winnipeg, proceeded next to The Pas, Manitoba in 1950, Yellowknife, NWT in 1951, Yellowknife and Churchill in 1952, Frobisher Bay in 1953, Goose Bay in 1954, when the priority afforded the Mid Canada Line displaced the plan for the Yukon and the year was spent doing SHORAN Recorded Photo – a combination of the two disciplines of SHORAN Survey and Photo operations – then the Yukon in 1955, followed by the lower Arctic Islands in 1956 and the upper Arctic Islands in April and May of 1957 prior to the spring breakup as all installations had to be completed by ski equipped aircraft. It will be seen from the accompanying map that the SHORAN Chains covered most of Canada. In all, 501 lines were measured between 119 stations though it required 191 station installations or reinstallation’s as some had to be installed twice, even three times, because they formed the link between chains on successive years. Similarly, 39 lines were re-measured when they formed connecting links. The following paragraphs detail a few of the difficulties that carrying out this task involved for the aircrews and the station crews who served at 408 during those eight most eventful years. 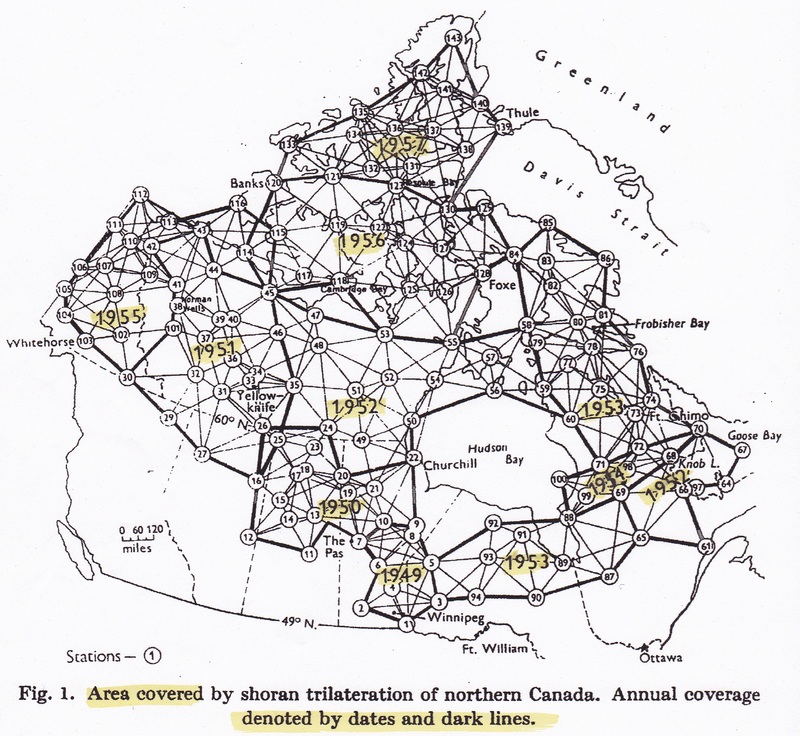 1949: Operations were based in Winnipeg though stations were well to the North in the muskeg and fly-ridden country that often forced station personnel to be net-covered throughout the day and night. 1950: Operations were based in The Pas and began very slowly because of radar unservicabilities, of both air and ground equipment, but by the end of the season 55 lines had been completed, double the 1949 output. Night flying contributed to the success rate. of roughly 25,600 sq. km. completed. 1953: An impressive 104 lines were flown this year covering Northern Quebec, and the Southern portion of Baffin Island. But as the operating locations moved northward, the conditions faced by both ground and aircrews become noticeably more difficult. Living conditions for all personnel were very poor. Lancaster aircrew often survived on flight rations for many meals as control over the kitchens was in US Army hands and operated to suit their construction crews. It was not unknown for crews to pump gas from barrels at places like Fort Chimo to fill a Lancaster or a Canso when operations found them short of fuel for their destination because weather reports were not received regularly because of poor communications. Canso crews faced conditions more dangerous than usual as some stations were installed from ocean shores. One crew spent an uncomfortable night using engine power to keep the Canso facing into wind as the water was too rough for take off and the on-shore wind threatened aircraft damage if it were to be driven ashore. Perhaps the most difficult of all SHORAN installations was that on Padloping Island, off the East coast of Baffin Island. All equipment was carried to the top of Mount Ruth, 915 feet above sea level and some 11 kilometers distant. Four airmen and a small band of Inuit took three and a half days to complete the task. Once in place their troubles were far from over, however. An August cold spell covered the 60-foot high antenna and its guy wires with ice. A partial thaw was not much help – the ice that broke free bombarded the tents below. Shortly thereafter, high winds brought the ice-laden mast crashing down into the camp. Fortunately nobody was hurt, and after a replacement antenna had been installed the remainder of their stay went relatively smoothly. One other noteworthy event of 1953 was the replacement of the Norseman with the DeHavilland Otter whose better payload did ease station installations in the smaller lakes denied the Cansos. 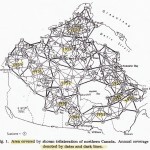 Communications of both HF and VHF were extremely poor over the Ungava area and flying programs had to be scheduled at night with operations the following day conducted without any form of communication with the ground stations or the operating bases from which the weather forecasts and reports were received. On one particular day, two Lancasters were near to being lost because of these poor operating conditions. The northern SHORAN season concluded at the end of August as the last Lancasters left in the middle of a snowstorm having completed a last minute re-fly finishing the chain. A second operation that Fall was conducted from the Lakehead when the Goose Bay Chain was connected with the original 1949 chain near Winnipeg. 1954: On April 3, W/C Jack Showler assumed command of 408 Squadron. Plans had been completed by his predecessor, W/C H. M. “Snapper” Smith, to locate the SHORAN Detachment at Watson Lake to complete the Yukon portion of the survey. But the Mid-Canada Line requirement took priority and the operating base became Goose Bay and the task became SHORAN Controlled Photo of a 40 Mile wide strip along the 55th parallel of latitude. The need was for 1:50,000 scale maps for siting the early warning radar stations. It required 7,841 line miles of SHORAN Controlled Photo to provide the coverage. SHORAN station installations began early using the Goose Bay ski-wheel Dakota with stations going in on the ice before break-up. The risk to station personnel of becoming isolated during break-up was ever present and an incident this year saw one station totally wrecked in a heavy storm and the station crew had to be rescued – after a miserable night in the open – by an USAF helicopter based at Goose Bay. The SHORAN Survey program suffered accordingly from a higher defence related priority. 1955: The work on the Mid-Canada Line was completed, as was the SHORAN Survey of the Yukon, 61 lines from 19 stations, the last remaining portion of the survey on the mainland but with a few stations located on the Western Arctic Islands. The operating base was Whitehorse. Much was learned this year and put to good use the following two years when completing the remainder of the Arctic, perhaps the most difficult portion of the largest survey project in history. 1956: The program was entirely on the islands this year and covered from West to East back to the Baffin Island chain completed in 1953. At the high latitudes being surveyed in the early part of the season, there was no open water for the Cansos to land on, so ski-equipped Dakotas or Otters delivered stations. Although the black flies and mosquitoes that plagued the men in previous years were thankfully absent, the sub-zero weather that kept them away was a hardship in itself. The backbreaking chore of getting the equipment to the top of the nearest hill remained and was aggravated by ice and snow. When possible, the task was eased by renting dog teams from the local RCMP detachment, or from a Hudson’s Bay outpost. In most cases, however, it was a case of carrying it all uphill, or dragging it on toboggans. After the operation, water-borne aircraft were occasionally needed to remove stations near inland lakes following breakup. 1957: In a reversal of previous years, the high arctic operation was conducted early before break-up occurred. This early start ensured there would be none of the earlier problems of extracting personnel from the ground stations which, during break-up, could only be accomplished by helicopter, an almost impossible situation in the Arctic Island geography. Much time was spent in planning logistics for this final portion of the survey. The remoteness of the region demanded careful coordination to ensure the timely delivery of all equipment to the selected sites. To this end, as much of the equipment as could safely be abandoned for the winter was left behind at Resolute Bay or pre-positioned at Thule AFB, Greenland by ship before the 1956 freeze-up. There were only 17 sites in the final chain, four of which had been installed previously while 13 were new and included Thule and the Greenland Ice Cap. The latter station, which was used to tie Canada’s survey geographically in with Greenland, had the distinction of being the last station of the survey to be shut down. The first line transits of 1957 were flown on April 15th. It was soon obvious that the combination of excellent weather, very good maintenance and highly proficient personnel was going to mean that the operation would be completed well ahead of schedule. On May 28th the last line was flown. Within 12 hours, W/C Showler and crew were picked up from the Ice Cap station. In a somewhat informal ceremony, Showler relinquished command of the station to a local Inuit and 408 Squadron personnel departed for home. During that final year, more than 1,000,000 square kilometers of Arctic terrain were surveyed under extremely difficult living conditions for those men who manned the radar posts on the ground, though they were now housed in Jamesway Huts rather than tents though the change meant heavier loads and longer installation times. Aircrews were faced with longer flights, fewer alternates and more difficult conditions at the stations themselves. In all, three hundred personnel were employed – approximately 30 more than usual – in addition to the crews who flew the Dakota, Cansos, the C-119s and North Stars which ferried supplies to main bases from Resolute, and on occasion, Thule. Aircraft maintenance over the whole eight years of the operation deserves special mention. Aircraft servicing and maintenance was carried out in the open for the most part and engines often changed under primitive conditions in record times. Much was asked of these dedicated men during those years from 1949 until 1957 and they responded with enthusiasm and professionalism. They were amongst the best.When 408 departed the Arctic in 1957, the RCAF was able to inform Mr. Ross, who had been retained as Dominion Geodesist beyond retirement age so that he might savour the fruits of his lifelong labor, that the program requested some ten years previously had been completed and that accurate maps that the squadron so lacked in support of its own operation could now be produced: no longer would aircrews be faced with maps devoid of any features or of the need to rely solely on astro navigation because geographic features were often miles from their correct position. No longer would the expression by 408 navigators be heard “we drew a map on the way out so we could find our way back”. In recognition of the work of 408 Squadron, as well as his own, W/C J.G. Showler was awarded the McKee Trophy in 1957 for the year’s most distinguished contribution to the advancement of aviation. The SHORAN assignment occupied 408 crews and aircraft for nine years. The claimed accuracy of the SHORAN Survey of Canada’s vast territory was an error of no more than twenty-five feet in every hundred miles, or an accuracy of locating each site to within at least 150 feet, a result that no other country using the SHORAN technique has been able to equal. When 408 Squadron’s work was finished, the resulting survey made much better maps of northern Canada a reality. The value of this achievement to Canada was enormous then and increases each year as the northern reaches and the Arctic increase in national value. In one of his speeches Mr. J. E. R. Ross referred to the SHORAN survey as one of Canada’s best kept secrets, that it had an international flavour because at that time it was a clear expression of Canada’s sovereignty over the north, displacing the American activity that had once been welcomed during WW 11. In all, 17,549 hours were flown over nine years by 408 aircraft on SHORAN Operations: Lancasters 6,746; Canso 6,214; Norseman 1,463; Otter 646; Dakota 2,460. No crews or aircraft were lost though the flying conditions facing the crews were amongst the most difficult experienced in peacetime operations. The performance by ground personnel, both those manning the SHORAN Stations and the aircraft maintenance personnel was no less noteworthy and, at times, more so. As a further point, the SHORAN surveys were the first significant investment in Canada made unilaterally in the High Arctic. If not for SHORAN, would Canada still have sovereignty in the Arctic Islands? “Per Ardua Ad Astra” aptly describes this most noteworthy achievement by the officers and men of 408 Squadron, RCAF, during the SHORAN years. It was their duty, well done and of enduring value to our Nation! Hello to you, the reader. I was a “SHORAN” navigator and Lancaster crew member for the 1951/52/53 survey seasons. Part way through the 1952 season I took over the SHORAN Operations Officer duties and was charged with the operational planning for the next year and a half as well as my navigation and SHORAN operations flying. It gave all of us such a strong feeling of pride that we were working on such an important task for Canada, and one that was so successful. The successful opening up of our northern territories, and making their resources available for development is hugely rewarding. We were all relatively young men doing that work ranging in ages from some WWII veterans to post war trained air and ground crews, so this huge task was accomplished by a squadron of relatively young air and ground crews operating over a huge barren spread of Canada. My Dad, Bill Drysdale, was an Airframe Tech maintaining the 408 Sqn Lancs used to map the north. He was in Churchill, Frobisher and Yellowknife. His team put two strips of masking tape near the starboard wing tip of “their” Lanc so when the aircraft banked to land at Yellowknife they would look up from their fishing boat and know if it was them, or the other maintenance crew that had to return to base! Served with this Sqn from 1951 TO 1953 on SHORAN OPS at Yellowknife, Churchill .Goose Bay. Frobisher Bay. My father, Bob Steele, served at the same time in the same places I believe. Did you know him? Hello, I think your Father was part of my station crew in 1954 when we did the extra stuff for the Mid-Canada Line. We nicknamed him “Stainless” of course. We had a great time at a place called Muriel Lake, which is now covered by the Le Grande reservoir. It was about half-way from Hudson Bay to the Atlantic. Later that year, we moved the station to Fort George, which was almost at the mouth of the Fort George River, now also called LeGrande. There was a Catholic and an Anglican mission school and a large Indian encampment. We finished the lines just as the first skim of ice was forming on the river. I would be happy to answer any questions you may have, providing my memory keeps working! I’m now 85 so we have to be sure all the marbles are still there. It was just a fluke that I found this site, but glad I did. Take care, and hope you get this OK. I started in 1953, with stations at Knob Lake (near Schefferville now)then at Ft. Chimo, Lake Harbour, Amadjuak Lake and a place called Gillian which was in the centre of the island, more or less. I was on that C119 that lost an engine just as we were trying to get over the last hump before Sept Iles. We were supposed to parachute out of the thing, when someone yelled out that we had 12,000 lbs. of cargo on board, and maybe if we threw it all out….we might manage to land ok. So we did. I think there was 8 or more Shoran stations, an AT=3 ground transmitter, about 1,000 lbs. THAT gave her a lift! Also all the squadron records went out as well, a trail of paper for many miles behind.About a dozen generators. You get the picture. After we landed at Sept Iles none of us ever wanted to even see a c-119 again, but of course there was one waiting for us and we had to get off the broken duck and climb indo a semi-broken one, which managed to get us to Rockcliffe. I never went near a C-119 again! Anyway, thought this migh be interesting. Hope it reaches you OK.